Growing up Catholic in a small midwestern town meant the traditions of our most universal holidays were a mix of sacred and secular. Easter came not only with the solemnity and pomp of Lent and Easter Mass, but the joy of bunnies and baskets of jelly beans and pastel boiled eggs. Halloween surely meant costumes and voluminous bags of treats, but the prayers and patronage of All Saints’ Day that followed were also demanded. And, of course, the big ticket item, Christmas, began with Advent calendars and candles lit during the four weeks before, to be accompanied later by a house festooned with Santas, reindeer, and every kind of snowman, snowflake, and Christmas tree. Christmas also meant carols: the holy kind— “Oh, Come All Ye Faithful,” “Joy To the World,” “Oh, Holy Night”—and the not-so-holy—”Frosty the Snowman,” “Rudolf the Red-Nosed Reindeer,” “Jingle Bells,” and the rest. I loved them all. The lyrics inspired every range of holiday spirit, the harmonies evoked joy in shared vocal expression, and the melodies stirred emotion and nostalgia whenever heard. That remains true even now. But there was one certain carol that touched my soul like no other. 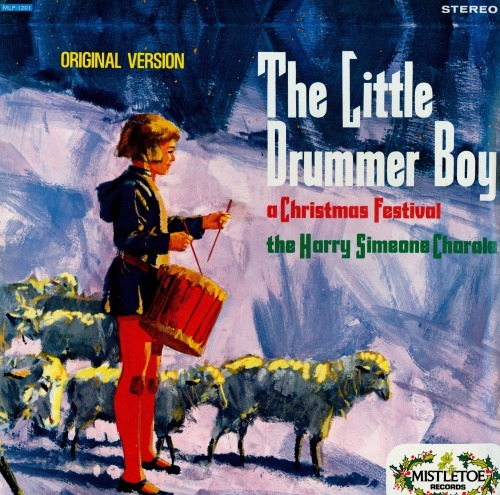 The almost mournful tone, the somber melody with its repetitive “pa rum pum pum pum.” When “The Little Drummer Boy” began playing in the rotation of stacked Christmas records, my siblings and I would respond almost universally: we’d stop whatever we were doing and start singing along, a chorus of voices in honor of Christmas and that little boy with a drum. Why this one song over any other? I don’t know, but to this day it gives me a shiver of nostalgia. So it was with great delight when, three years ago, long after record players were retired and we’d gone from albums to cassettes to CDs to iTunes to streaming music, my brother showed up at our holiday celebration with two vintage LPs of this beloved song; the original recordings, with the memorable album cover, sung by the Harry Simeone Chorale. Just looking at that cover brought back so many poignant and visceral memories, but it was listening to it (on an accompanying CD!) that transported both my brother and I back to our little house in Illinois, with its warm rooms decked in Christmas finery and the gaggle of siblings leaping about, singing “pa rum pump pum pum” full throttle. It seems some things never completely leave you. Being the contemporary girl I am, I wanted to share both my beloved original version, as well as a most modern one by a favorite group of mine. Enjoy… and Merry Christmas! And for those who’d appreciate a little extra Drummer Boy trivia, there’s always its page at Wikipedia! NOW STAY ONBOARD: The next stop on the indieBRAG Christmas Blog Hop is tomorrow, December 12 with Valerie Biel. Thanks for sharing this with us, Lorraine. Strange isn’t it how the world is changing so much. I wonder what there will be to trigger my children’s memories in quite the same way as an LP cover. Back in the day they were the be-all and end-all to life, it seems. YES, album covers were the be-all and end-all, David! I so remember laying on the floor of the living room, record player cranked up loud, listening and singing along while reading the lyrics off the back cover or the inside fold. Such an important part of the experience. Though I have no doubt, despite the sometimes strange and inexplicable changes and trends of the changing world, children and young people of today will have their own versions of such memories. They’ll be different, but just as poignant, I have no doubt! Thanks for leaving a comment, David. And Merry Christmas! Thanks, Stephanie… I was delighted that you invited me to participate. So many stories and moments come to mind when we think of our lifetime of Christmases… glad this one resonates! Merry Christmas, Stephanie, and thanks for all you do for me, and for all of us! I love this carol also. Your post brought back a lot of memories of my own. Thank you! You’re so welcome! I think this song really does strike a chord with a lot of people…I’m glad it brought back some memories for you. Have a really wonderful Christmas! I love both versions of this wonderful song. Thanks to my son, I am now a huge Pentatonix fan, too. Thanks for sharing! This was so wonderful Lorraine- It brought back such memories. Singing at the top of our lungs (pretty badly!) was always part of the holiday! So true! The louder the better! Thank you, Geri. I was delighted to be included in the Hop and always appreciate your support. Have a GREAT Christmas! Don’t they just kill it?! Interesting how much I love both versions… the power of a good Christmas carol! Thanks for commenting and have a wonderful Christmas, Emily! Thanks for sharing! I love how music can bring back memories and feelings. As for times changing, my 9 year-old-daughter once described her ‘dream list’ as a playlist. She said the dreams were in her mind with their own sort of album cover and she scrolled through them until she found the dream she wanted. So I think covers are still significant, they just present in a different way! And somehow I had not been aware of Pentatonix – I might be a new fan. I love your daughter’s idea! Amazing how, despite changing times, music and its images, both real and imagined, still so resonate. Thanks for your comment, Carrie, enjoy getting to know Pentatonix (they’re so great! ), and Merry Christmas! That’s a good one too, JF! 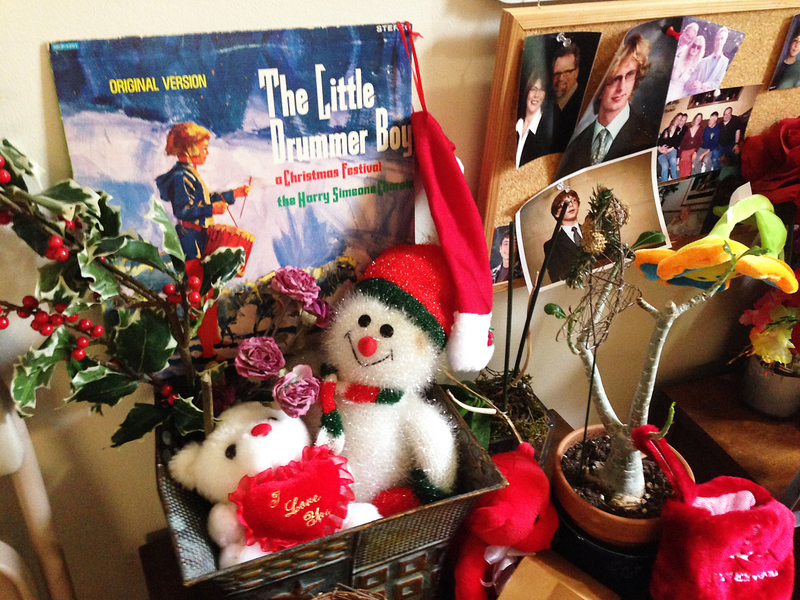 Thanks so much for reading and leaving a comment… and Merry Christmas! Thank you for that. Came at just the right time for my wife and I. Our last living parent will entering assisted living soon. I called her yesterday, and we chatted about where I’d been flying lately. Then she told me to say hello to Daila. That’s her son’s wife. And then she asked about the dogs. We don’t have a dog. I didn’t say much, then said my goodbyes. My wife and I will busy ourselves finding copies of all the music she used to love. Thank you, so very much, Lorraine. They say there are no coincidences. Maybe they are correct. My mother-in-law’s name is Lorraine also. What a touching comment! I’m so glad this resonated with you, G. I so understand what you’re going through with your mother-in-law…it’s quite a journey, in ways heartbreaking and yet sometimes so sweet and touching. Music can be such a pleasurable and connecting factor; I’m glad you and your wife will gather Lorraine’s favorites! I wish you all the best in this chapter of your family’s life…and a very warm, Merry Christmas! That’s a lovely story. That carol (or Christmas song) has always been one of my favorites, too. I had never seen the video before, though, so thanks for sharing it. Thanks, Joe! I’m discovering it’s a favorite of many. Have a great holiday!